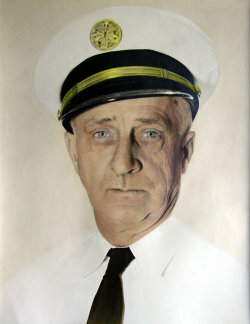 During its infancy, the Chepachet Fire Company needed a chief with determination. Walter Keach was that man. In the forty years he was chief, he saw the Company go from a hand-drawn chemical wagon to an up-to-date, modern firefighting company. Chief Keach was a man of strong convictions. He had ideas on how a fire company should look and how it should be run, and he was never lax in putting his ideas in motion. Chief Keach saw the Company through two World Wars and the frustration of not being able to get equipment to run a fire company. There was double-jacketed hose that you couldn't bend, but that the government liked; trucks from the government surplus; and miscellaneous equipment like nozzles that were for pumping from a pond, but not from a tank truck. Despite all these setbacks, the Chief managed to bring the Chepachet Fire Company up to a modern firefighting unit. 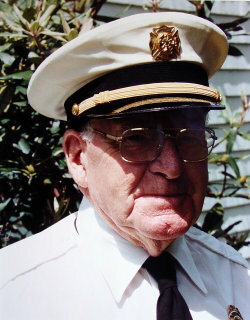 When he retired in 1953, it was with a heavy heart that the members of the Company and the people of Chepachet said God speed and thank you for his many years of service. Chief Chase was with the Company as Chief just a short time -- hardly enough time to get comfortable in his duties. But he was a worker. Chief Chase initiated the purchase of the four-wheel drive truck, as well as the building of the addition to the Fire Station. He was taken ill in 1956 and passed away soon afterward. 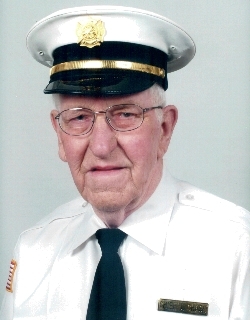 Leslie Davis was with us as Chief nine years, and a very busy nine years it was. After thirtyone years he finally got the street lights installed, extended the District lines to what they are today, and helped celebrate the 50th Anniversary of the Company. He instituted the purchase of a new truck, and also obtained our first S.C.B.A. 's or "Scotts", although everyone was reluctant to use them. Chief Davis was a man of humor and a man of seriousness. He would play a joke on a man one minute and reprimand him for doing something wrong the next. "Let", as he was called, was a man who could see the future. He dreamed of making the Chepachet Fire Company the best in the state. Unfortunately, he never saw that dream come true in his term. 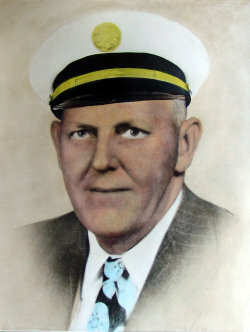 He passed away in 1966 after only nine years of leading the company. Chief Lewin started his career as Chief with a bang. He began the Rescue Squad in 1966 (and has regretted it ever since). He approved the formation of the men's and women's muster teams, the ladies' auxiliary, the rewriting of the Company's bylaws, the purchase of a 2500 gallon tanker, new rescue truck and pumper, the expansion of the fire station, and many other smaller projects too numerous to list. He saw the first woman firefighter voted into the Company in 1981, and there have been many more since. 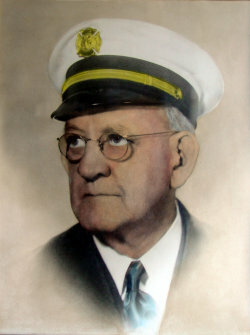 Chief Lewin oversaw all Company activities with diligence and with the energy of a man many years younger. He preferred not to use a Scott, but never hesitated to go into a smoky building. He believed his officers should do their jobs or step down. After a fire or rescue incident, he would either say "Good job" or "Why wasn't this or that done when it should have been?" In May of 1982, a testimonial was held in Chief Lewin's honor. He said at that time that it was not a retirement party -- he had too much more to do.